No outdoor space is complete without life, and we keep that in mind in all of our designs. We don’t just build structures; we create complete, functional outdoor living areas. We intend to exceed your expectations as we help you develop your landscaping vision. We look forward to showing you what we can do! With 40 years of experience, The Roving Horticulturist can create and install natural designs using well adapted & native plantings for your home. Our designs emphasize native & adapted plants & the highest quality hardscape materials. We create landscapes that will flourish-smart designs that are new & unique, yet all based on sustainability. The decision to hire a landscape designer and builder involves a lot of trust. Someone who can add to the elements you already have to create something amazing. This is what we do. Check out our work! 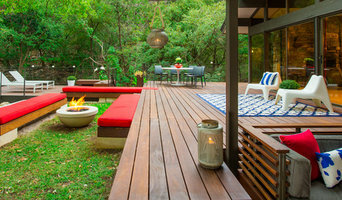 Greenbelt Design Elements is where your yard dreams, become a reality! We specialize in luxury outdoor living spaces, from plans and designs, to construction and completion. Native Edge is an Austin-Based, full-service landscaping business committed to responsibility—to our environment, our community, and our clients. Harold Leidner Landscape Architects specializes in the design and installation of exceptional residential properties and gardens that extend the outdoor living experience of our clients. We bring 15 years of design innovation and expertise with local materials and native plants to each project, providing clients with unique, sustainable outdoor living spaces built to fit their lives. Vincent Landscapes, Inc. is a Central Texas-based multidisciplinary design and construction firm focused on commercial, multifamily and residential landscape design and landscape construction. ADLA Studio offers complete design services from conceptual and schematic design through final construction. Our diverse background provides the framework for our design approach. Rain Lily Design creates landscapes that blend exterior and interior spaces to achieve outdoor rooms in any environment. We take projects from design to installation and on to continued maintenance. We provide landscape design services that add value to your property while accommodating your budget. Every design is tailored to enhance the quality of life and maximize your property’s potential. D-CRAIN Design & Construction specializes in custom solutions integrated to your specific outdoor living needs. Our team leverages experience in architecture, ecology & skilled building trades. We are renowned for its distinct modern yet timeless; organic but structured use of restorative, native, & naturalized plantings combined with visually striking vessels and tailor-crafted hardscapes. 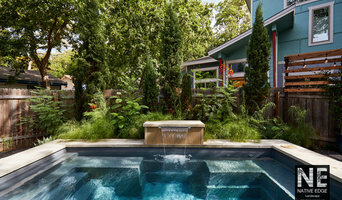 Austin Living Landscapes is a design-build landscape company in Austin. Our work spans from Lakeway and Bee Cave to Central Downtown Austin and North Austin. Design-build means we provide design and installation services to our clients. Our style ranges from contemporary to Hill Country native depending on the client's needs. Clients have chosen us because they were concerned about the look of their home, frustrated that work wasn’t getting done in a timely manner and upset with lack of professionalism of landscape companies in Austin. Kevin Wood Landscapes is an innovator of modern organic design, specializing in native landscapes planned to fit your home or business needs.